Ultra-high-energy cosmic rays (UHECRs) are puzzling astrophysical messengers: simply put, we do not know where they are produced, how they arrive here and their composition. Black holes in AGNs and GRBs are plausible cosmic accelerators of these particles, but in order to pinpoint the production sites we need to cross-correlate the arrival directions of UHECRs with catalogs of astronomical objects. Astrophysical 𝛾-ray sources are appealing candidate accelerators of UHECRs since by their very nature they involve extreme particle acceleration and large energy transfers. I performed a cross-correlation analysis of 27 events measured with the Pierre Auger Observatory until late 2007 and the positions of AGNs closer than 200 Mpc in the Fermi LAT First Source Catalog published in 2010. I found a strong correlation (>5σ) between the directions of the UHECRs and 7 “𝛾-ray loud” AGNs which are likely candidates for the production sites of UHECRs (Nemmen et al. 2010, ApJ, 722, 281). 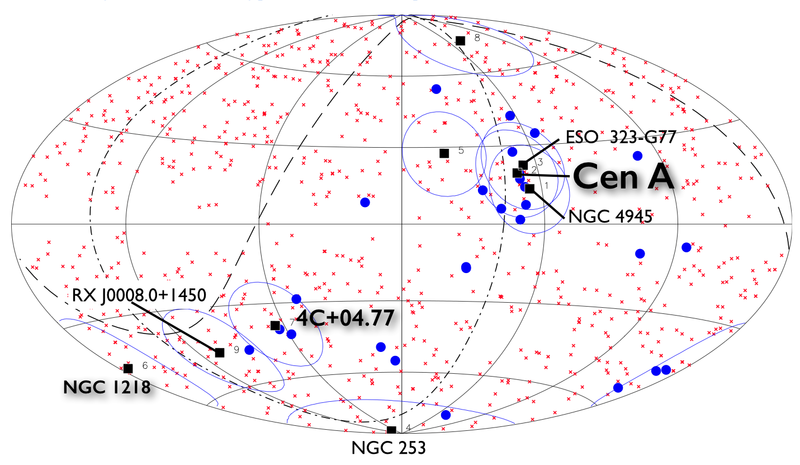 Aitoff projection of the celestial sphere in Galactic coordinates showing the UHECRs (blue circles) and the 7 AGNs detected with Fermi LAT within z≤0.048 (squares) which are likely UHECR accelerators (Nemmen et al. 2010, ApJ). I am interested in performing cross-correlation studies of ultra-high-energy cosmic ray arrival directions with updated astronomical catalogs and using improved statistical methods (e.g. bayesian).